When Joe Frazier walked into his Philadelphia gym, it was as if he was showing up at Madison Square Garden for another bout with Muhammad Ali. But instead of a young, muscular man in boxing shorts, 62-year-old Frazier shuffled past the ring with a stoop in his walk. His black brimmed hat was low on his forehead and his suit jacket hung loose over his T-shirt and suspenders. “Who let the dogs out?” Frazier shouted before ambling through the dimly lit gym and clambering up the single staircase to his apartment. One of Frazier’s 11 children, Marvis Frazier, followed close behind to make sure the former boxing champ was ready for visitors. “You OK, pops?” Marvis asked. Frazier nodded. Yes. In his home office, Frazier sat slouched on a sofa and reminisced about his heyday as a world heavyweight champion. While the memories were still vivid, Frazier said he doesn’t think much about those fights. That was a long time ago. Frazier retired from boxing in 1976. 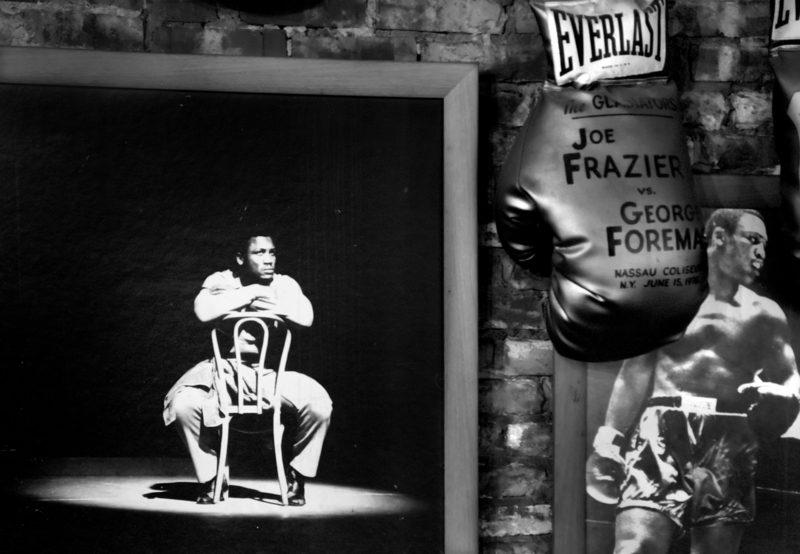 The South Carolina native has lived above his gym–Joe Frazier’s Gym–for the past 29 years in a rundown part of Philly. The musty, dank boxing arena is a far cry from the days when Frazier danced in the ring with the likes of George Foreman, Jimmy Ellis and, his nemesis, Muhammad Ali. Frazier became a professional boxer in August 1965. He won his first 11 bouts by knockouts and retained his heavyweight title in March 1972 by beating Ali in a 15-round decision at Madison Square Garden. He had a career record of 32-4-1. Frazier doesn’t get in the ring much these days except for a charity benefit now and then. 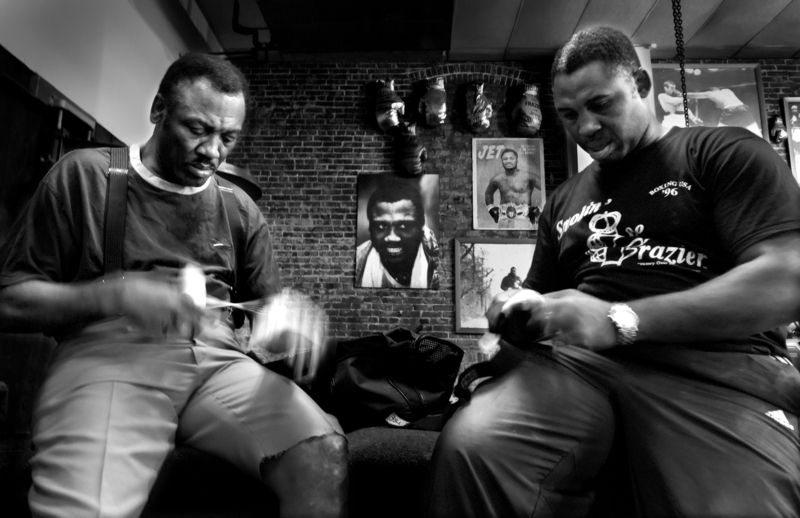 I never imagined being in a boxing ring with a heavyweight champion, but in the fall of 2007, I found myself in the ring with one of the most well-known boxers of them all, Joe Frazier. The meeting was somewhat spontaneous. A few days before traveling to Philadelphia for a photography workshop, my husband, Pete, and I found out that Frazier was living above his gym in The City of Brotherly Love. Frazier was a boxing legend who had won a 1964 Olympic gold medal and who had taken down Muhammad Ali during the “Fight of the Century” in 1971. He had a 32-4-1 record. The thought of him living in a rundown part of Philadelphia was a bit surprising. During a break in the workshop, Pete stopped by Frazier’s gym and met the boxer’s son Marvis Frazier, himself a former professional boxer, who invited us to come back later to talk with his dad. When we arrived at the gym later that day, Joe Frazier wasn’t there. As we waited for him to return, we looked at the photographs that hung on the walls. Many showed a young, muscular Frazier taking on opponents in the ring. When Frazier walked through the door a few minutes later, it was obvious that age had taken a toll on the champion. He walked with a stoop, his skin was loose and his speech was slightly garbled. He was no longer the powerful fighter depicted in the photos. But when Frazier talked about his career and invited us in the ring for a photograph, the years seemed to fade away. While he no longer looked like the brawny boxer who had earned the nickname Smokin’ Joe, it was clear he was still a champion at heart. 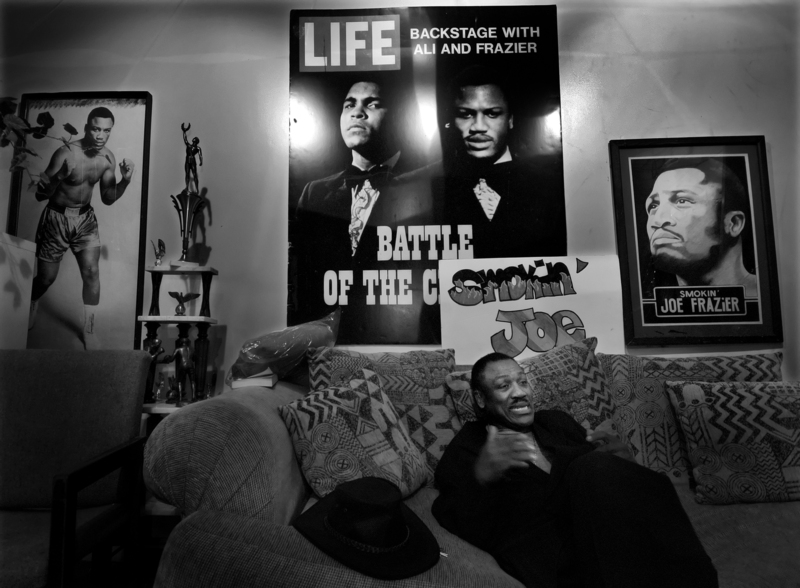 Joe Frazier died Nov. 7, 2011. He was 67. After talking in his apartment, Frazier requested a few moments of privacy. He appeared at the top of the stairs several minutes later wearing a pair of white Adidas boxing boots, a black T-shirt, suspenders and a pair of pink cut-off shorts. “The heavyweight champion of the world … Smokin’ Joe Frazier,” Marvis Frazier bellowed, imitating the late ABC sports announcer Howard Cosell. It was time for Frazier’s daily workout. He walked for a few minutes on a treadmill then took a few jabs at a punching bag. While Frazier may not be the unstoppable millionaire boxer he once was, he still has a presence, said Leslie Wolff, Frazier’s business and personal manager. Pete Marovich is a photojournalist based in the Washington D.C. metro area covering the White House and Capitol Hill. He is co-creator of American-Journal Magazine and serves as photo editor. Jenny Jones is the editor and co-creator of American-Journal. She has more than 15 years of experience working for daily newspapers and monthly magazines. She is a freelance writer based in Virginia.